Wow. How can I begin to sum up one of the most spectacular cross-cultural wedding experiences I have ever witnessed? I don’t even know. It’s honestly very hard to imagine squeezing in all the details about this amazing experience in this blog, but I will do my best. Saul & Therese are a wonderful, fun and unique couple from opposite parts of the world. Both are steadfast in their faith, wise, and talented in their own ways. Therese is from Norway and Saul is from Congo. 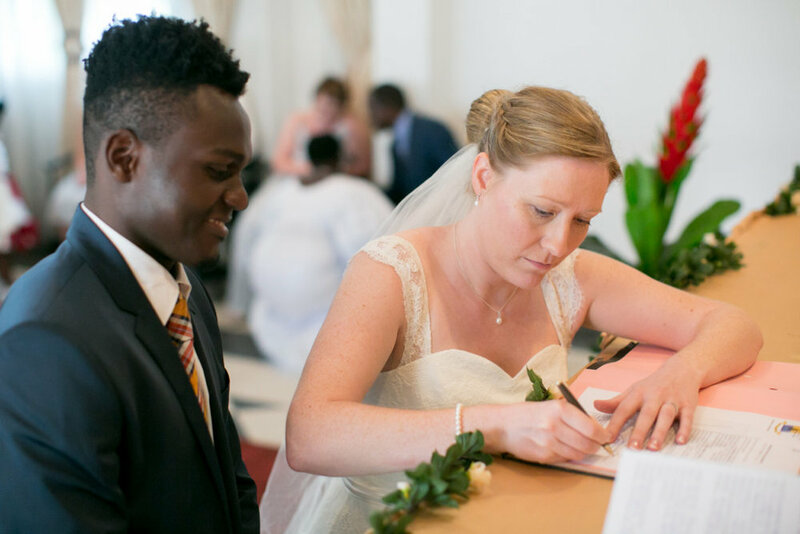 They met while Therese was docked in Pointe Noire, Congo while she was serving with the eye department aboard the African Mercy, a part of Mercy Ships a couple years back. 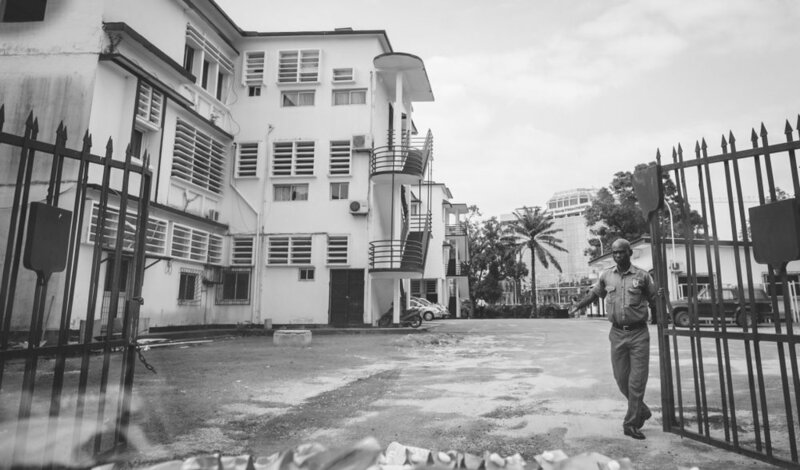 Saul is from Pointe Noire and was assigned to be Therese’s local translator when she was docked there, and well, the rest is history. 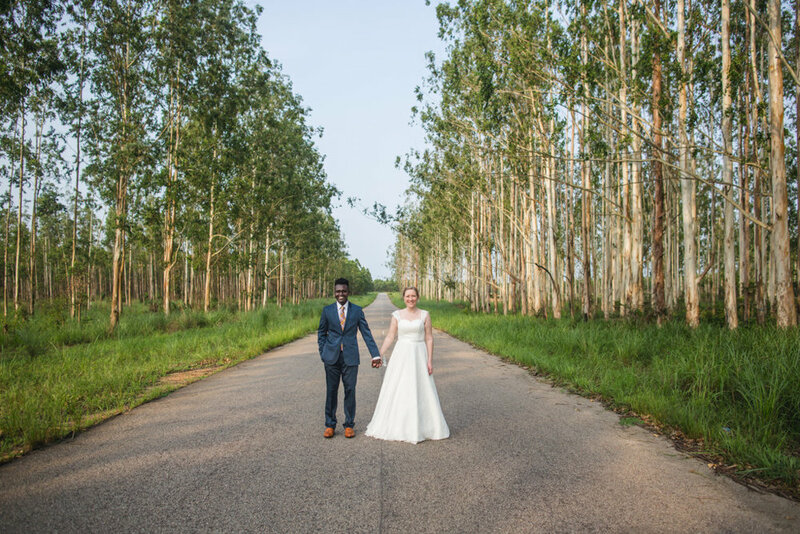 For myself, to have had the chance to fly all the way down to Congo to document this wonderful wedding was a wonderful privilege to say the least. This was my 11th country to shoot a wedding in, and it was quite possibly the most unique, eye-opening, and fascinating cross-cultural wedding shoot I’ve done yet. Although the republic of Congo is sometimes seen as a country of extreme poverty, government corruption and on-going hardship, our entire time there was overshadowed by the incredibly kind, beautiful people we encountered over the course of the week we were on the ground. Plus the amount of SUN we gladly soaked in our skin was enough to make any Scandinavian dweller do a little jig. Congo was alive not to mention the fact that Pointe Noire itself was a constant buzz of fascinating new sites, sounds and impressions… that alone is for another blog another time. 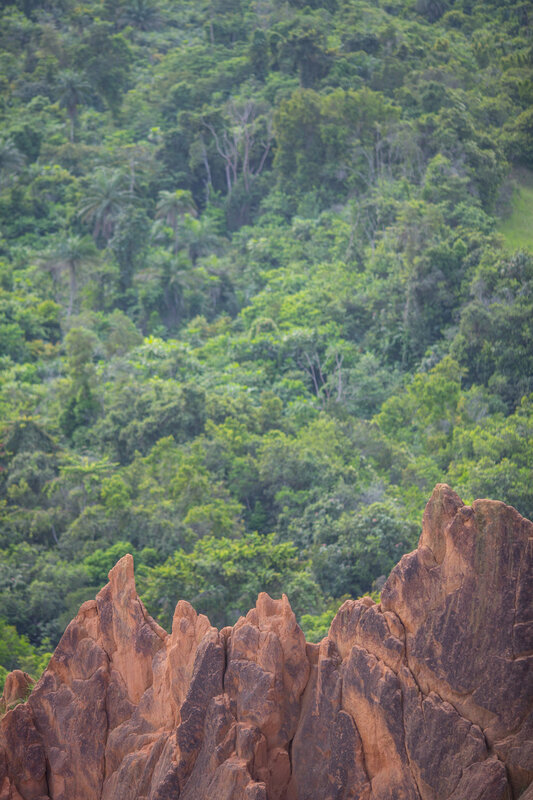 When it came time for the wedding and photos, we decided to do a pre-wedding shoot the day before where we took the bridal couple out to a beautiful lookout with classic African red dirt and giant lush green trees in a giant valley called “The Gorges”. 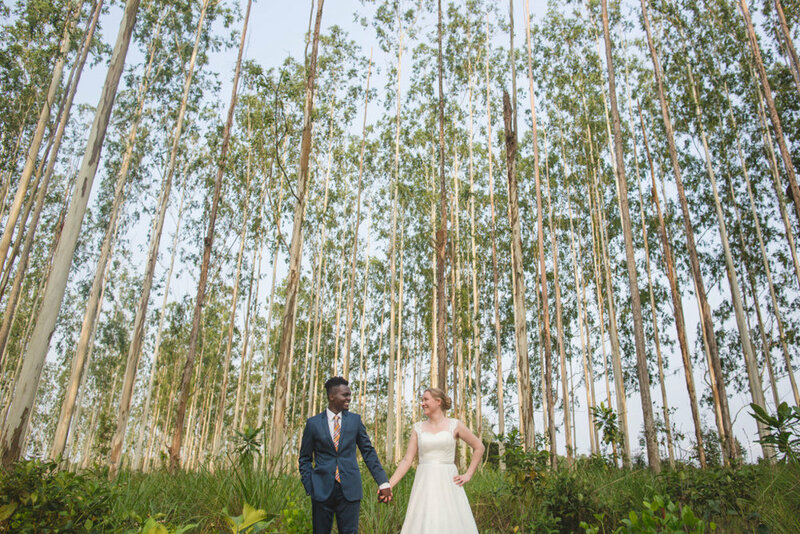 Just before our taxis got to the Gorges, I noticed several large eucalyptus forests and I decided to start off our shoot here. 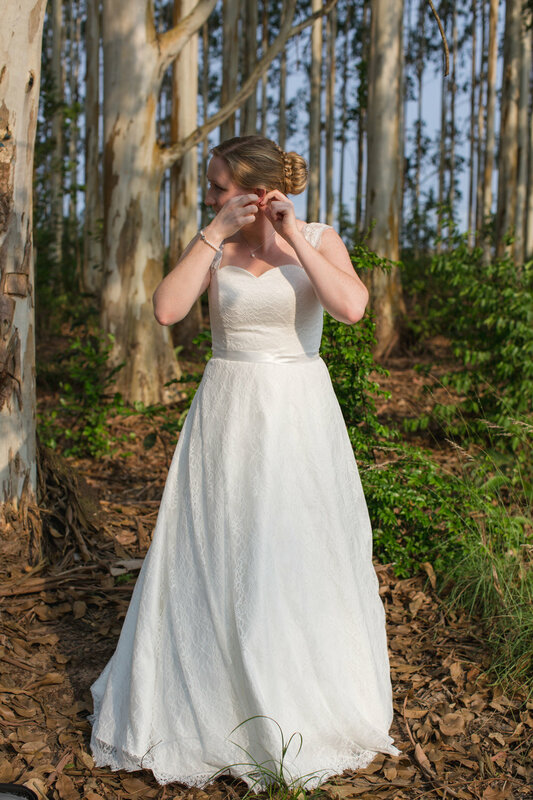 Therese got into her dress beside a eucalyptus tree and Saul awaited their “first look” deeper inside the forest. 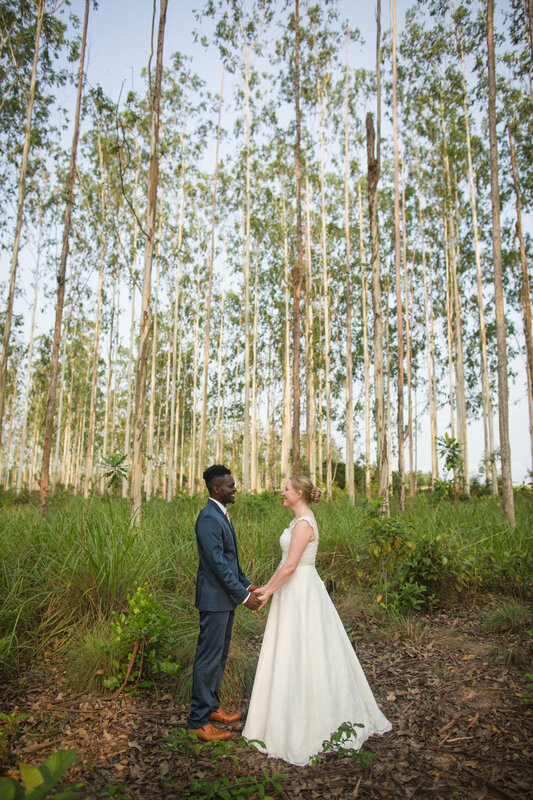 It was a special moment to witness as they saw each other for the first time in their wedding attire… (in a gorgeous eucalyptus forest in Congo nonetheless!). We shot the first portion of images inside this forest then waited for the sun to set a little more before we finished our shoot at the Gorges. On the wedding day itself, we started the day by getting ready in the apartment we were staying in (Saul even got to help Therese get ready since he had already seen her the day before in the dress). 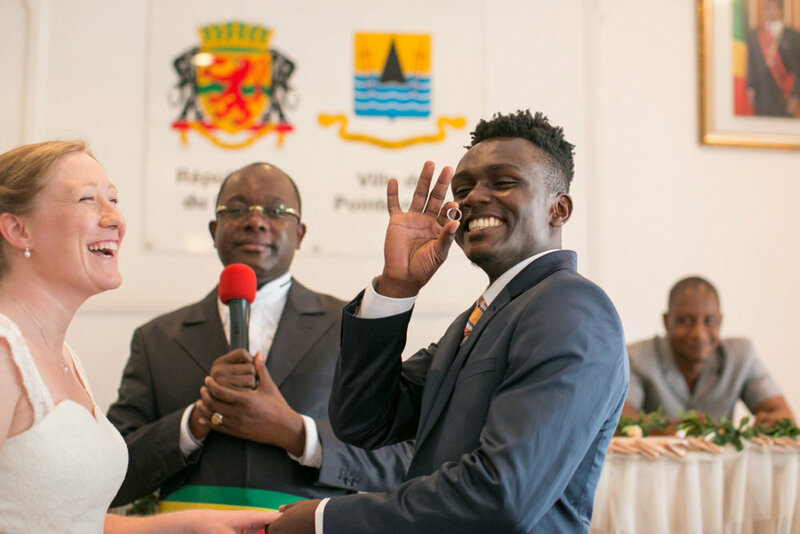 Then we continued on to the local town hall and we waited from 11am to 1pm to be able to enter for the wedding ceremony (which was performed by the local district mayor). There were several weddings in front of theirs, and therefore it took a couple hours to enter. Everything happens on African time so patience is the best virtue there. Especially when it’s 87 degrees (30c) and incredibly hot/bright sun, with high humidity! Luckily Therese waited in the “wedding” car that was semi-air conditioned– and Saul waited with his family inside, in a separate cooled room. When it was their turn to enter the court room, we all hustled in and found our spots. What quickly surprised me was that all the sudden in a room full of 70-80 guests, there were atleast 8 other “pro” photographers and videographers buzzing around the room photographing anything and everything. 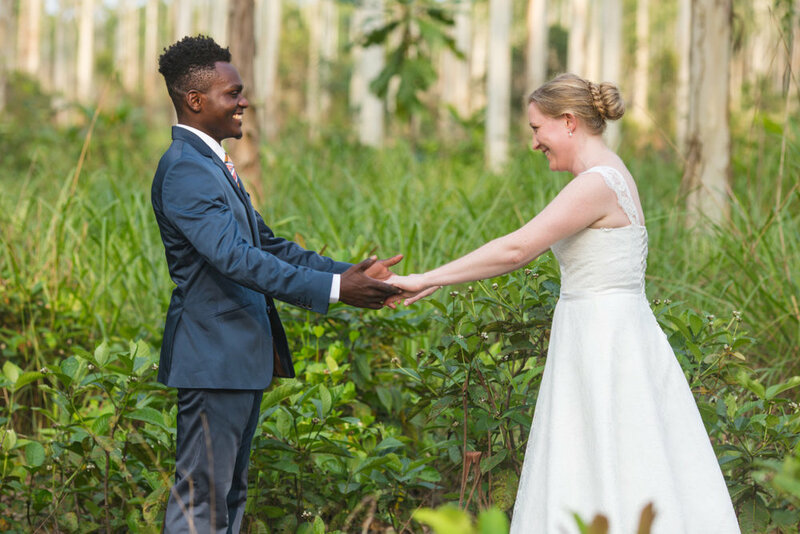 I quickly realized this was culturally normal and it was no longer just me shooting this wedding… these were not hired photographers either, but men that come to random weddings, take photos, and try to sell the prints at the reception/party later on. After a while, I realized some of them were trying to help me by pointing to where I would get the best shot according to what was happening next. Aside from that, the wedding proceeded in French, and the excitement in the court room built as the ceremony was finalized and Saul & Therese were officially married! It was a beautiful moment indeed. Afterwords, we all walked outside, and the photographer crowd grew even bigger as a traditional portrait time commenced on the front steps of the town hall. For me, this part was quite intense and also very fascinating. 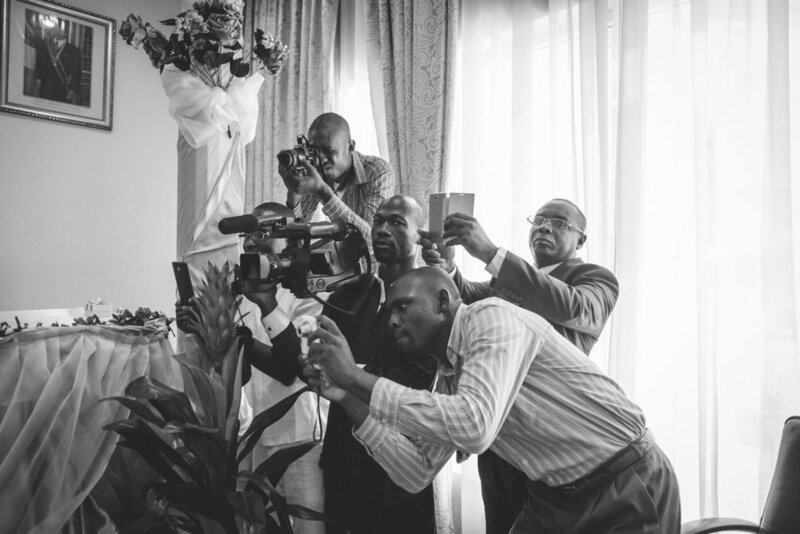 I had several, Congolese men crowded around me with their cameras nearly pushing me out of the way while frustratedly exclaiming to me in French: “Madam! Madam!”… It was around this time that I jumped in front of all of them and took a quick shot of these guys in action. You can clearly see on some of their faces joy and laughter, and others just pure frustration. Haha. Oh my goodness. What a moment! After the ceremony, we ate lunch with Saul and Therese, and then took a few more photos before heading back to the apartments for some rest before the evening festivities. Around 8:45pm, people started to gather down in the courtyard, and the caterers, family and friends were soon ready to party. There were about 100 people at the wedding dinner. All in all, the wedding party/reception was pretty low-key. Mainly, there was gift-giving, delicious local food, cake cutting and some quality hangout time. A great way to end a great day. 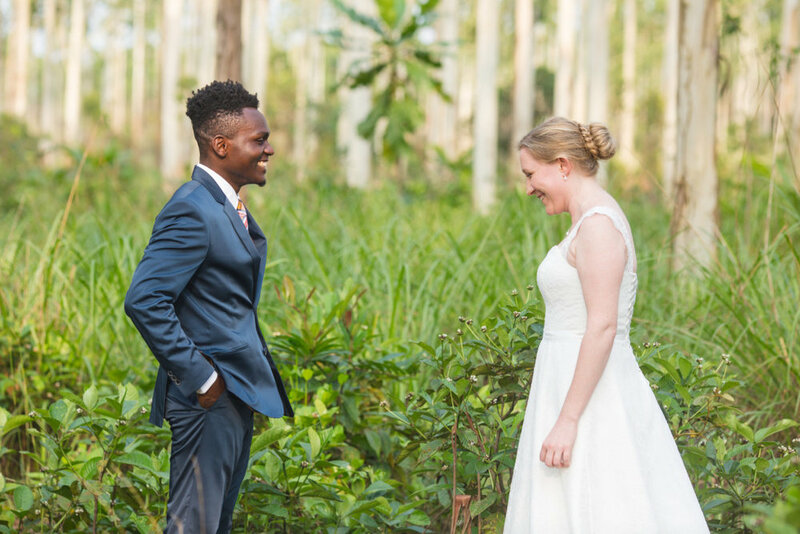 The images you see here are a mix of moments from the pre-wedding shoot and the wedding day itself. I have a mix of black/white and color images depending on the mood I felt each photo or moment represented. 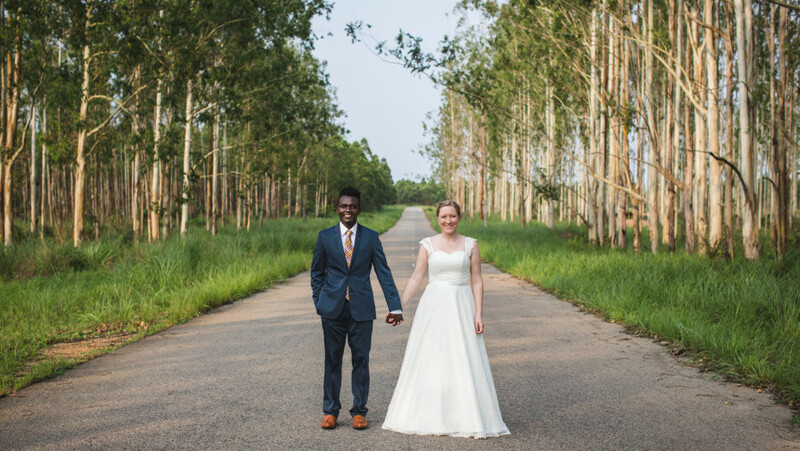 Thanks again Saul and Therese for the wonderful opportunity to photograph your wedding in Congo! Still can’t believe I actually got to do it… So amazing!